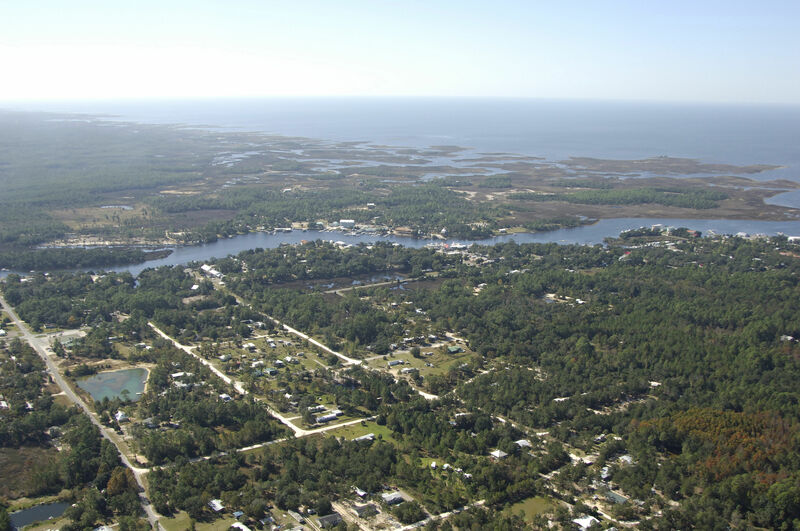 Steinhatchee is a quaint and quiet coastal fishing town located on the upper West Coast of Florida about 77 miles southeast of Tallahassee and 100 miles southwest of Jacksonville. There are several processing facilities for the local seafood industry ashore, and additionally the marinas here that normally cater to commercial fishing boats always make a concerted effort to accommodate cruising boaters. The image above is a view from the east looking west over the Steinhatchee River and into the Gulf of Mexico. 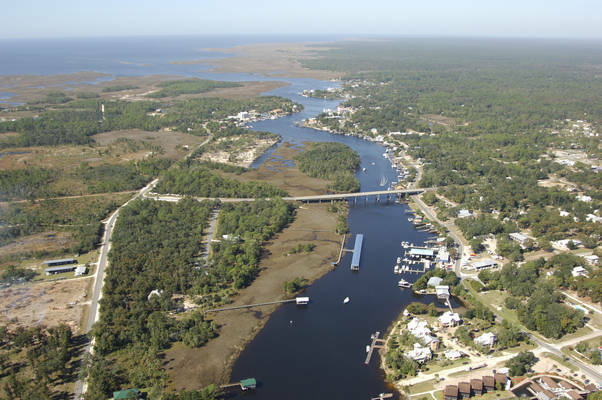 the state Route 51 Bridge (45-foot fixed vertical clearance) is visible just west of the Steinhatchee Resort and Marina and the River Haven Marina and Hotel. There is no real anchoring space on the river due to its narrow width. Moorings are not available. The approach to the Steinhatchee river is from the west via a channel from the Gulf of Mexico. Flashing green 1 is located near waypoint 29 39.345N 83 27.410W. Once you have arrived in the area and picked up flashing green 1, follow in the long line of markers that outline the 4-foot deep channel into the river. These are after flashing green 1, in order: Green daybeacon 3, flashing green 5, green daybeacon 7, red daybeacon 8, green daybeacon 9, green daybeacon 11, red daybeacon 12, green daybeacon 13, green daybeacon 15, red daybeacon 16, flashing green 17, and further up a line of marks to quick flashing red 32, where the river makes a sharp bend into town. Most of the marinas are congregate in the vicinity of the bridge, but we advise t hat you radio ahead to make sure they have space before you go to all the trouble of navigating the long entrance channel into the river. The state Route 51 Bridge crosses the Steinhatchee River about two miles up from the Gulf of Mexico entrance with a fixed vertical clearance of 45 feet. Steinhatchee, like many West Coast Florida towns is remote and getting to an airport or any other major transportation hub will require some creativity. The Ancient Oaks Airport is nearby, but private. Gainesville Regional Airport is 68 miles away to the east and Jacksonville International Airport is 100 miles to the northeast. 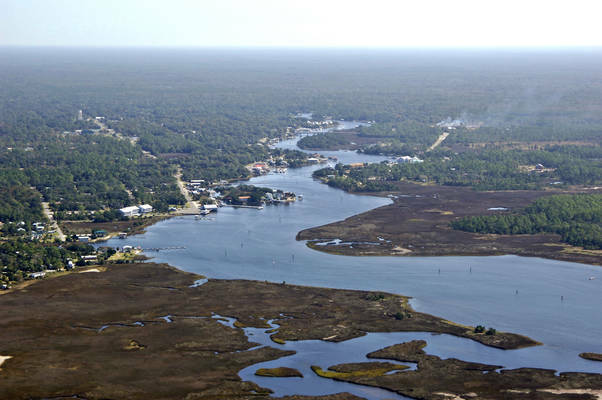 Securing a car rental is your only real option to get out of Steinhatchee, except for your boat. No reviews yet! 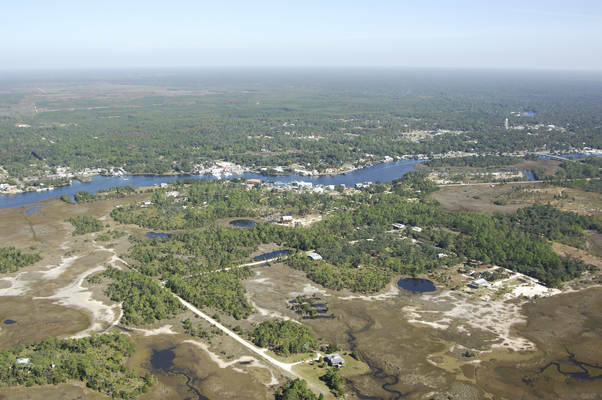 Be the first to write a review of Steinhatchee.